Superman Annual #1 came out this week, the opening volley of the Scott Lobdell era on the character. Plotted by Lobdell, scripted by Fabian Nicieza, and drawn mostly by Pascal Alixe, the book reads a bit uneven. There is a lot of Superman in this book, no doubt. But there are also a lot of other characters in here as well, interacting on the periphery of the plot and probably foreshadowing some big crossover in the future. As a result, it felt a bit disjointed, as if DC was using this book to introduce (or reintroduce) me to some characters I haven't been following. And it is an interesting opening chapter for Lobdell to start his Superman run with. For starters, Superman is basically ineffective this entire book. He is outgunned by the main villain Helspont. In some ways, that's good as it places Helspont in a high tier of someone who can actually be a threat. By being trounced thoroughly and yet continuing to rise up to fight again, I got a sense of how Lobdell characterizes Superman. There are some nice bits sprinkled throughout that make me think Lobdell understands the essence of Superman. But by having Superman be completely powerless against the threat, I felt like Superman did little here, instead having things done to him. There is a fine balance between establishing a worthy villain and making the hero seem worthless. This skirted on the later. Perhaps the biggest thing that I thought about this being Lobdell's opening chapter is that it felt like a big story that Superman was a part of rather than a Superman story. It almost felt like it should be a one shot with a unique title highlighting the Daemonites. The book opens with a flashback to Helspont's origins some 3000 years ago. He feels that his mother's intermingling of Daemonite genes with other races has weakened the proud race. He wants to bring back the glory of a pure race, re-establishing the Daemonites as conquerors of the universe. Sounds pretty racist and evil. And the queen responds appropriately, exiling him. But Helspont, here called Artus, also makes other comments ... about rising infant mortality, worsening autoimmune deficiencies, and cancers. His own wife died in childbirth from some medical weakness. And all this decay is happening while the rich ruling class indulges itself. This sounds like he is trying to save a sinking ship, trying to help the dying 99% while the 1% throws parties. So maybe the guy with the flaming skull head isn't all bad? It is hard to get away from the 'pure race of conquerors' bit though. After the flashback, we get to see what Lobdell thinks of Clark. I have to say I liked what I read. As Clark he likes to take the subway in to be among the people, to be normal. He thinks it makes him feel ..... (shudder) ... grounded. I don't know if I will ever hear that word in regards to Superman again and not think of JMS' wipeout of an arc. 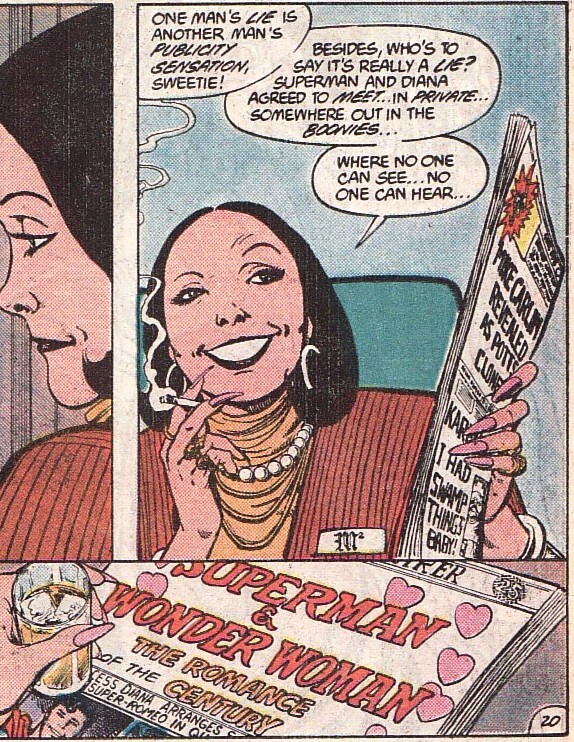 But then we get this panel about Lois. When thinking about the more sensational aspects of the Planet's news these days, Clark misses Lois. She would straighten things out. He misses her, lamenting the fact that he didn't realize what she meant to him. Now as much as I loved this panel ... I mean loved it ... it flies in the face of the cover of Justice League #12 and all the news about that. I'd prefer this panel to that story every time. His trek to work is interrupted by the sudden appearance of a massive spaceship hovering over Earth. 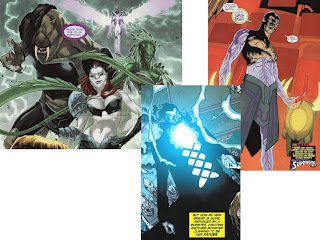 A super-vision peek reveals Helspont is there. Switching to his costume, Superman flies into space to confront the Daemonite. But before he can reach the ship, he is stopped short by Helspont. Now this is what a 2 page splash should be. Because Helspont is literally tugging on Superman's cape. (I wonder if that line is lost on younger readers.) Regardless of Jim Croce lyrics, it shows just how powerful Helspont is, just how beneath him he feels Superman is. This is a playground maneuver. 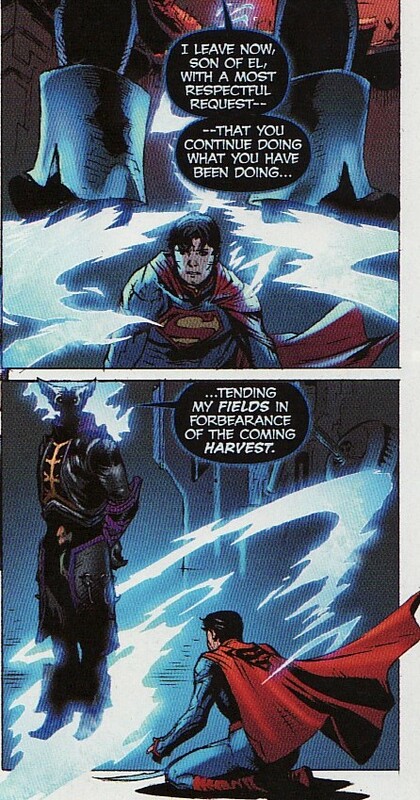 I don't need to hear Helspont lord his power over Superman. This image does it for me. That is what comics should be about. This tug is followed by a backhanded slap to Superman which sends Superman crashing into the moon and knocking him out! The annual then takes a bit of a sidetrack as Helspont sends out emissaries to some of the alien heroes on Earth, trying to persuade them to join his mission and discussing the legend of 'The Thirteen Scions of Salvation'. Much like Helspont beating up on Superman, his agents also pack a lot of power as they confront the heroes. 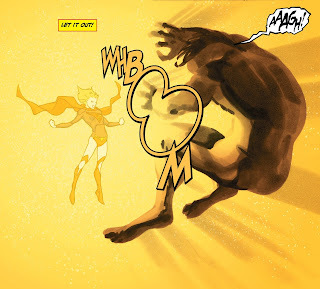 First Martian Manhunter gets beaten up by the female Salu. Now J'Onn recognized her as an agent of Helspont and initiated the fight. But she ends it. And leaves after telling him he either is going to join Helspont or die. 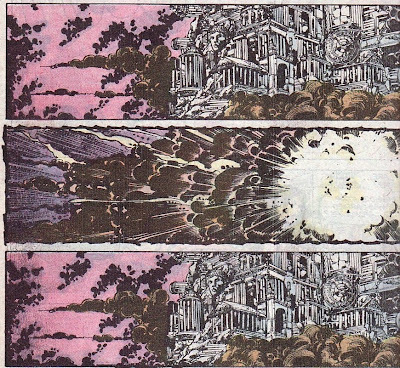 Given the Steranko-like panel effects and the rough art, my guess is these pages were done by Marco Rudy. Perhaps these were initially planned to be in Stormwatch? Then the ever-voluptuous Starfire is approached by Quom. Naturally, he finds her sunbathing on the beach in a mere slip of a bikini. Where else would you find Starfire? Anyways, in much the same way, she initiates a fight with Quom and is dispatched easily. He also reminds her about the legend of the thirteen and tells her she needs to join or die. It is interesting that Starfire has heard about this legend, equating it to a fairy tale rather than a prophecy. And this being the Starfire interlude, the art is much smoother. But I wonder if these were pages ear-marked for an issue of Red Hood. 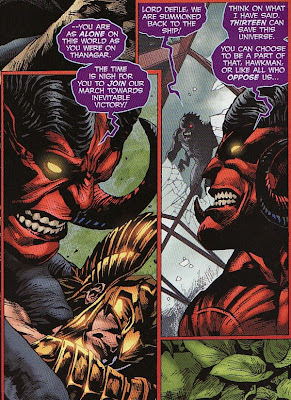 And then Lord Defile (yeesh ... what a name) shows up to batter Hawkman and also give him the ultimatum of joining Helspont or dying. Again, the art here is different ... maybe Tom Raney? Could these have been pages originally planned for a Hawkman issue? 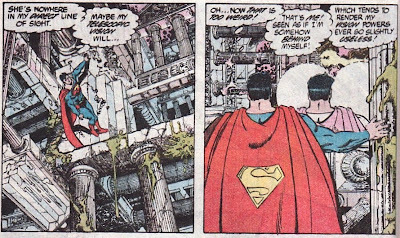 Between these scenes, Superman is actually saved by Grifter and brought onto his pod. Again the art is different. Could these have been lifted from a Grifter issue? Remember, this annual was initially solicited as a completely different story written by Keith Giffen. Could DC have decided that rather than running these bits through individual titles building a crossover there, that they simply consolidated them, bulking up a single issue of Superman into a super-sized Annual? The bottom line is that the 'Thirteen' myth isn't mentioned again, only in these other heroes' interludes. So given the initial bend of Helspont wanting a pure race, having him gathering other races in a way that didn't impact the main story with Superman, felt wrong, as if scenes from one movie were cut into another. In the meantime, Superman makes his way onto Helspont's ship to confront him. 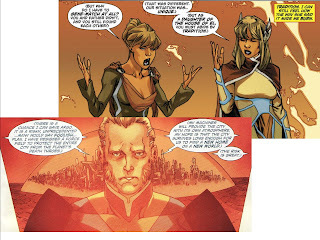 Helspont states his reason for visiting Earth was to kill some of his sleeper agents that he has on the planet. Helspont even kills some of his crew that is helping keep Superman at bay. It is the action of a madman that Helspont justifies by swearing that his execution of millions will, in the end, save trillions. He also says his agents welcome death if he orders it. Superman isn't so sure they went willingly. And the ends never justify the means. It turns out that there are a lot of Daemonites living among the people of Earth. Thousands of years ago Helspont put them there to help keep track of the metagene in Terrans' DNA. He thought that gene might rectify the problems in his own races' genome. Unfortunately, those agents went native and lost sight of the task. And so they needed to be eliminated. This is an interesting plot point, one I hope gets explored more in the future. Were these being immortal? Long-lived? Did they mate with humans? The truth is Helspont didn't need these agents on Earth to act as a shepherd humanity's metagene. Superman is doing that already. Look at that last panel. Helspont smugly standing there, hands behind his back, while Superman is small and on his knees. 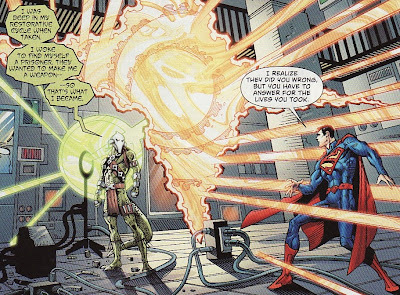 Superman has been unwittingly serving Helspont and is basically powerless before him. Another nice panel meshing words and pictures. So I credit Lobdell for elevating Helspont as an adversary for Superman. Helspont's whole demeanor throughout this encounter has been one of haughty derision, just effortlessly turning aside Superman's attacks and doing whatever he wanted to do. And to add a wrinkle to all this, Helspont states that not only has he killed Kryptonians before, he knew Jor-El! 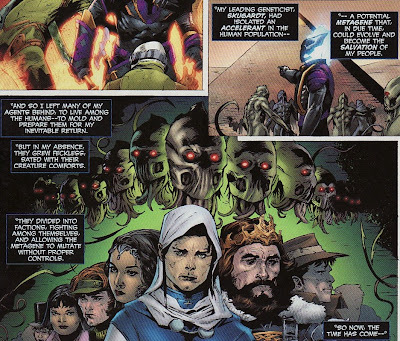 And here I thought Helspont was basically just an Atomic Skull/Mongul mash-up. He seems deeper and more interesting than that. 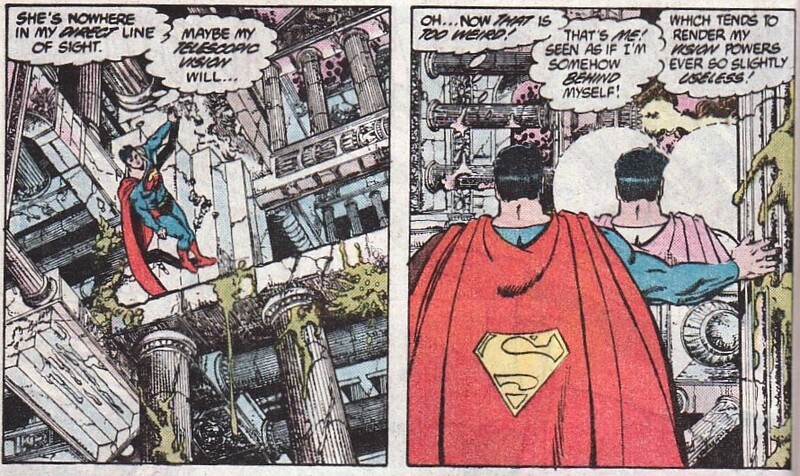 And so we get this final panel showing a defeated Superman, clueless about what he should do next. Had this been a stand-alone Superman issue ... if the Martian Manhunter, Starfire, Grifter, and Hawkman pages not been in here ... I probably would give it a B+ for the opening scenes of Clark and for defining Helspont so formidably. Unfortunately, those pages are in here and seem out of place. 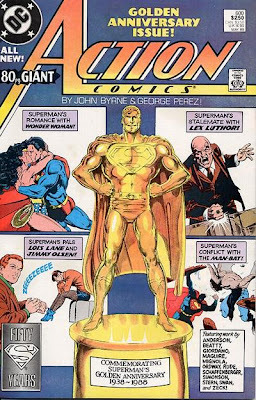 I can't help but think that when Giffen's Annual was shelved that DC cobbled this thing together from a planned Superman issue and some pages from those characters titles. 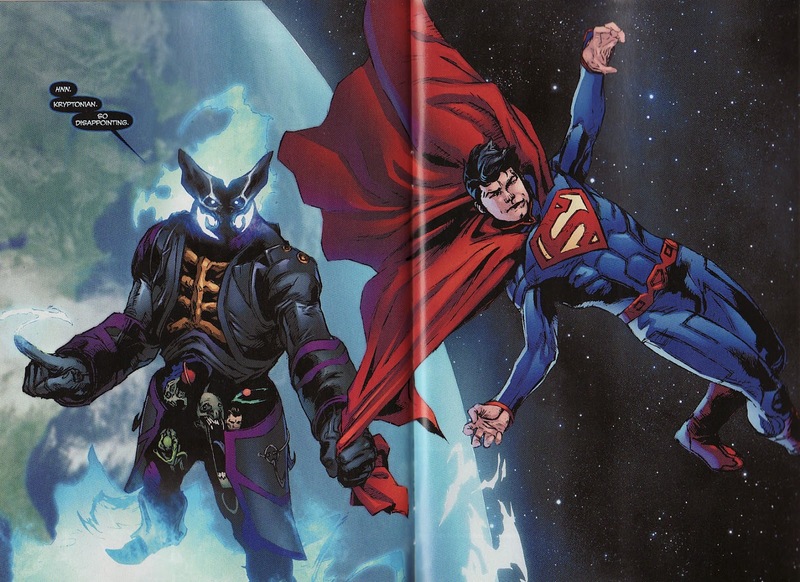 And while those pages involve Helspont, they don't mesh with the story involving Superman. As a result, the book felt just disjointed enough, the art just varied enough to drop a bit. Pascal Alixe's art is pretty good as he channels Gary Frank and does a decent job. As said above, panel composition was solid throughout. And, at least in this issue for one panel, Clark mooned a bit over Lois. So at least I got that going for me. I did an overall review of the ComiCONN last week, saying what a great convention it was. As I had said in my pre-con report, I wasn't necessarily heading there thinking of getting commissions. But once at the con, things changed. As for me, when it comes to commissions, the artists I go for fall into three categories - people who have a history with Supergirl, people whose art I love, and people who might have an interesting take on the character. Sometimes artists fall into more than one category. Giarrusso falls into the latter two buckets. I have enjoyed his strips with my kids and like his art a lot. I also thought he would have an interesting take on the character and I wasn't disappointed. What a fun commission this is. 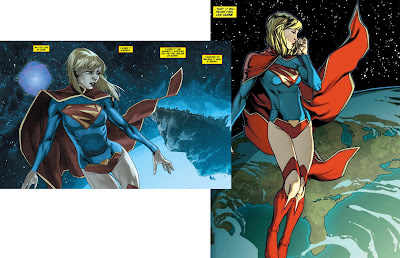 Something that I really liked about this take on Supergirl ... she is wearing leggings, giving her a sort of Cosmic Adventures-like feel to Kara. So this was another little treasure from the ComiCONN. Look forward to heading to this convention moving forward! It's all over the news ... everywhere. Superman and Wonder Woman are going to be an item in the DCnU. We have seen clips on Good Morning America. We have seen ludicrous on-line dating pages for the heroes. It feels all wrong because the dialogue implies that it is their isolation, their feeling of not being part of humanity on Earth, that has thrust them together. 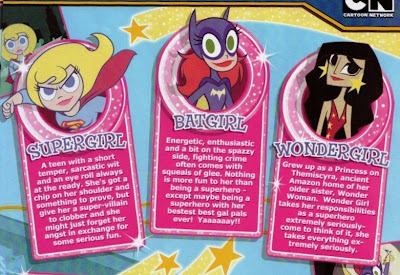 Once again, it seems like DC doesn't understand any of their characters. And this theme of isolation is just so pervasive. Even love is built on isolation. It is wrong because as part of the DCnU Lois and Clark were broken apart because Superman in a relationship didn't make sense to DC's editors. So let's put him into a relationship one year later. I just don't know if these two would work in a relationship. This is a longish post. And so I thought I would look back at Action Comics #600, a comic which came out about one year after Wonder Woman was re-introduced to the DCU in Legends and looked at a Superman/Wonder Woman tryst. 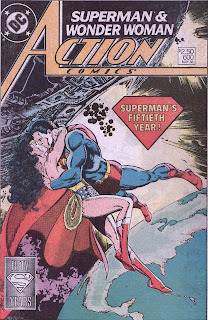 Interesting that both stories about a Kal/Diana romance came out one year after a reboot. 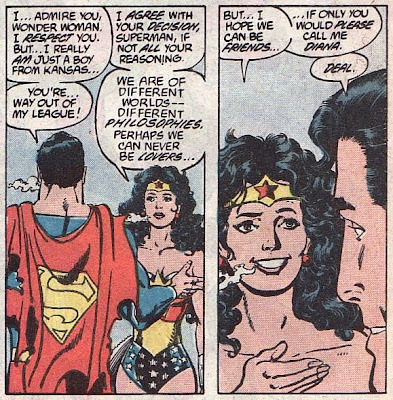 This story in Action nicely sums up why I think Superman and Wonder Woman might not make sense romantically. I love this issue's cover, a throwback to the old 80pg Giants, from the panels showcasing the stories inside right down to the classic font and coloring of 80pg GIANT. The opening page looks like the originally planned cover, perhaps before it was decided that this issue would be an oversized anniversary issue. Interesting to see this version of 'the kiss' and compare it to Jim Lee's cover from today. It is a dazzling picture and certainly would have got some attention back then. It would have been easy for DC to run this as the cover with some blurb about 'other stories'. As for me, I like the one that was used, a fitting cover for a landmark issue in which this kiss is just one of a handful of stories and pinups. This story is also interesting for the art choices. The breakdowns are done by John Byrne who was driving the Superman ship creatively. 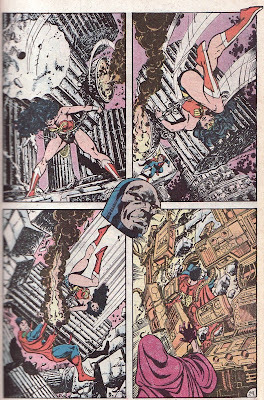 The finished art is by George Perez who was driving the Wonder Woman title creatively. So there is a sense of institutional collaboration with these characters. I wonder if Geoff Johns got to make the decision about this romance on his own without asking Brian Azzarello or the Superman writers if it effected their plans. 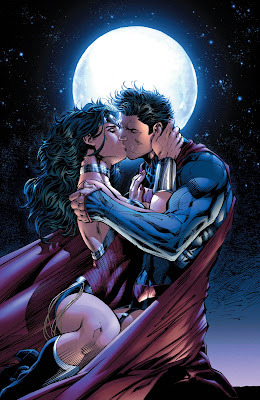 The story opens with Superman and Wonder Woman kissing passionately ... followed by Superman apologizing for being 'out of line'. There is so much said in this opening conversation. Wonder Woman didn't expect such passion. 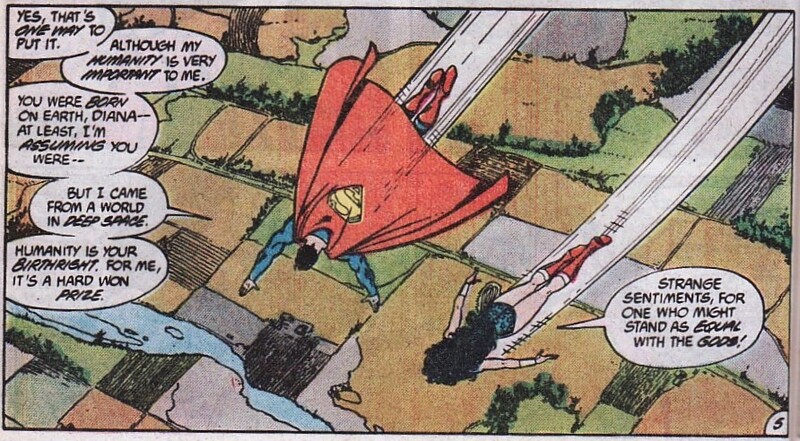 Superman says he isn't good with this romance stuff, falling over himself to apologize for the kiss. Just solid characterization there. The two then talk about how while they have only met briefly they have been on each others' minds for weeks. 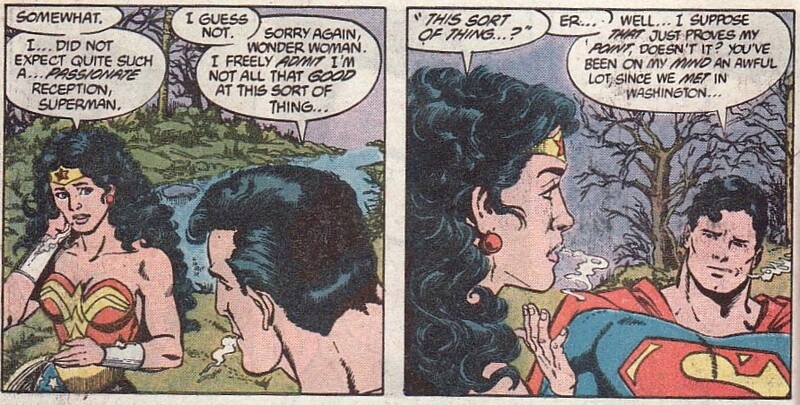 Wonder Woman has gone out of her way to not think about Superman. 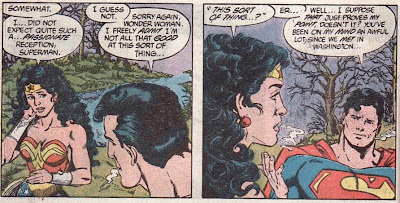 Superman even admits to having an (ahem) intense dream about Wonder Woman. It seems like they would be a natural couple ... so why fight it. With the awkwardness of those first few moments out of the way, the two decide to give it a whirl. 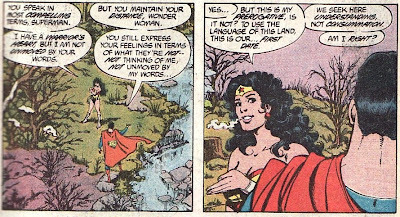 It is interesting to hear Wonder Woman here, talking about how she has a warrior's heart that has been softened by Superman's words of love. And then she states that they are looking for understanding of their feelings for each other not consummation. So why not have a 'first date'? That just sounds like Diana. And so they start chatting about themselves in a classic 'blind date' sort of way. Superman takes her to his favorite hangout spot, flying over the fields of the midwest. And he talks about how important his humanity is to him, how he has fought hard to be a person of Earth, one of the people. That is what Superman is all about, feeling like he is one of us and wanting to help. 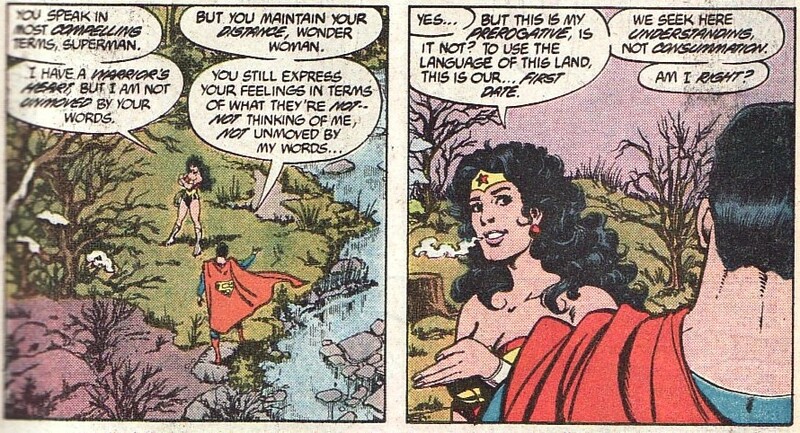 It makes little sense, even Wonder Woman says it is a strange sentiment. But that is what makes Superman who he is and why he is an inspiration. Before the two can go any further, a portal opens up in front of Diana where a wounded Hermes tells her that Olympus is under attack. Diana knows her responsibility and leaves Superman, flying through. 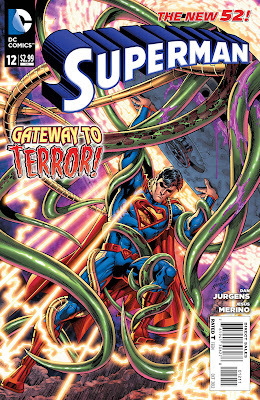 Superman follows through and finds himself on the twisty, turny, Escher-like Olympus from those Perez days. Even Superman's vision is wacky in this place. Incredible stuff by Perez here, making the home of the gods difficult for us mortals to understand. Since the two heroes entered the portal separately, they arrive at different places in Olympus. 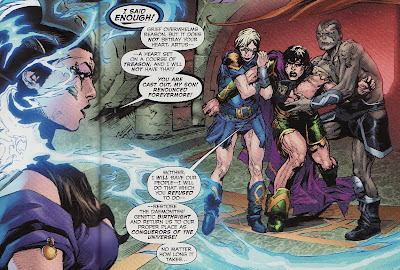 As for Wonder Woman, she arrives at Hermes' side and learns that the threat to Olympus is Darkseid. Darkseid hoped to take over Olympus and enslave the Greek gods only to find none of the gods at home (outside of Hermes). So his troops are scouring the place looking for any of the deities. Now that Superman and Wonder Woman are also around, he can have even more fun. In the classic switcheroo, Darkseid decides to use some deception to have weaken the spirits of the heroes. So a tranfigured Amazing Grace goes to seduce Superman in the guise of Wonder Woman. And Kalibak in the form of Superman, shows up to throttle Wonder Woman. 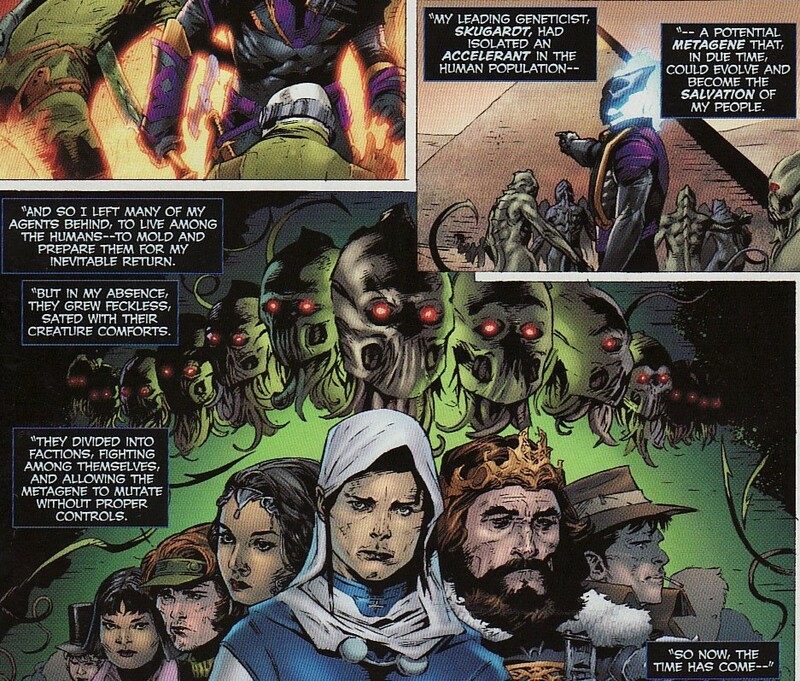 I am glad that DeSaad was around for this plan because it seems more his style to torture the heroes emotionally. In one of the more innovative parts of this story is Byrne's explanation why Darkseid is interested in Olympus at all. 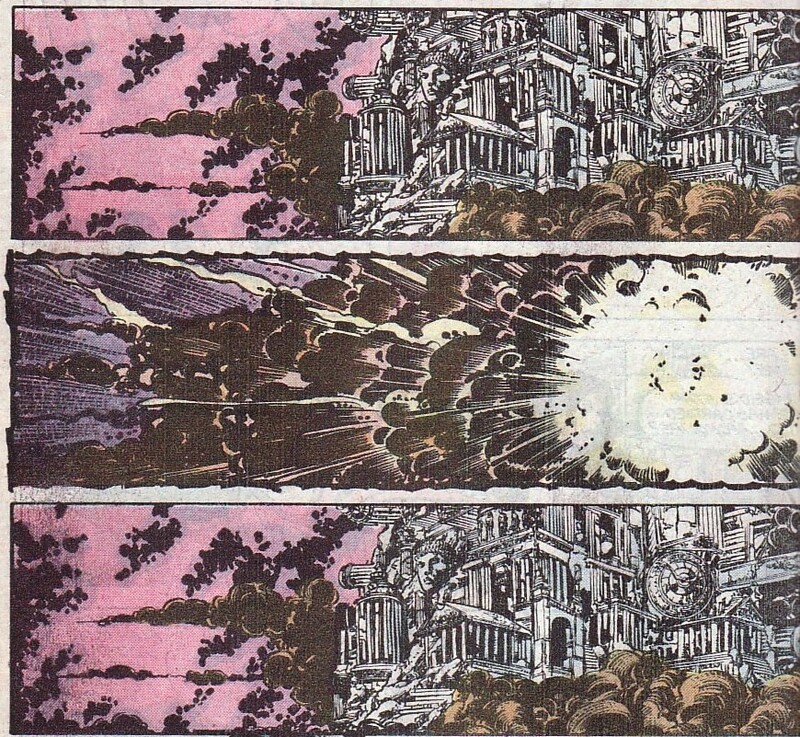 According to Byrne, the old gods died and an explosion formed New Genesis and Apokolips. Some of the energy scattered across the universe, including one beam that struck Greece, in essence, creating the Greek gods. I don't know if I particularly like this explanation, adding Fourth World plots to Earth history. But it is interesting. Superman fights the phony Wonder Woman. 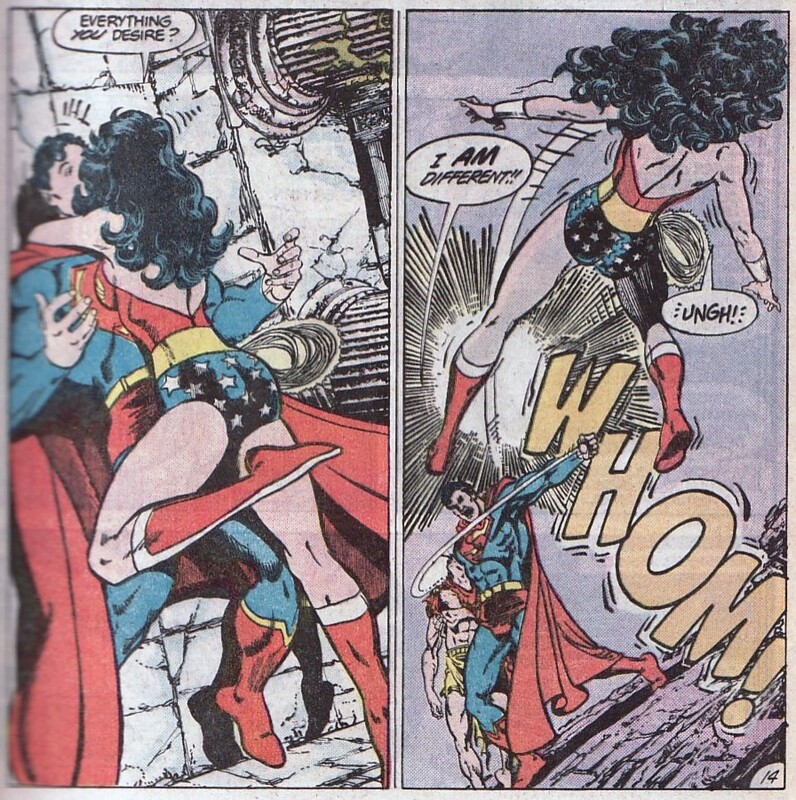 Wonder Woman fights the phony Superman. And then Kalibak and Amazing Grace sneak away, setting up the real Superman to fight the real Wonder Woman. There are several pages of the two brawling across Olympus until finally they crash into Darkseid's control room. It turns out that the heroes were smarter than Darkseid anticipated. They realized early on that they were fighting each other and so shadow-boxed across Olympus to get closer to Darkseid's lair. These are some really beautiful pages by Byrne/Perez showing just how equal in power Superman and Wonder Woman are. The gods aren't around. He has been outwitted by Superman and Wonder Woman. There is nothing left for Darkseid to do except some property damage. And it turns out he lined Olympus with Apokoliptian explosives. 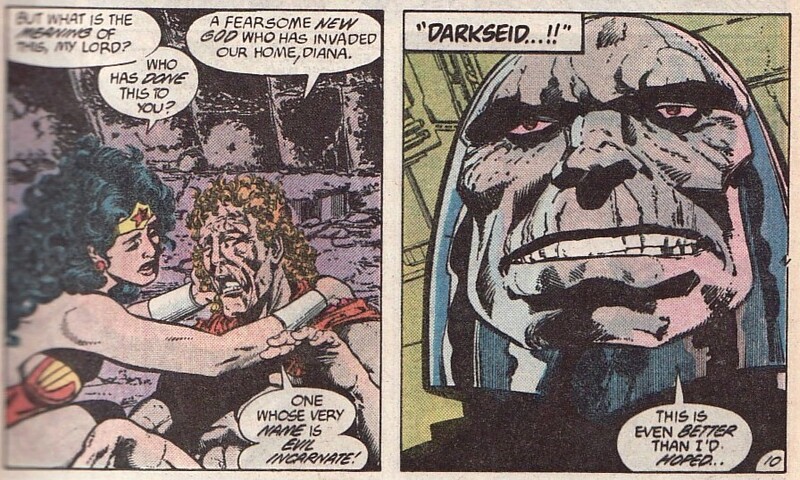 I find it amusing that sometimes Darkseid is this bigger than life Universal force. And sometimes he is just a galactic thug, offing his own men and planting bombs. But Olympus is eternal. Despite the explosion, Olympus remains untouched. And here is the ending that I love so much. After this little adventure Superman realizes that Wonder Woman is out of his league. He really is 'just a boy from Kansas'. He doesn't feel comfortable walking among the gods. That isn't who he is. And Wonder Woman realizes that their philosophies wouldn't necessarily jibe either. But they can be friends. You know what ... that makes sense! But in the DCnU, we have a distrusted Superman floating over everyone all the time. And his isolation is the common ground for this relationship in the new Justice League book. It reminds me of the sad and twisted relationship between Dennis Barclay and Liz Tremayne in Alan Moore's Swamp Thing. She once said "All we have in common is the horror in our lives, Dennis. That's what holds us together." That isn't healthy. Perhaps most ironic is the interlude in this story where a sleazy tabloid editor decides to run a story about a Superman/Wonder Woman romance because it will be a publicity sensation and will sell copy. Is there any different motive in the current book? Anyways, I love this issue and this story because it does such a good job with the characterization and personalities of Superman and Wonder Woman while showing why they wouldn't be a couple. 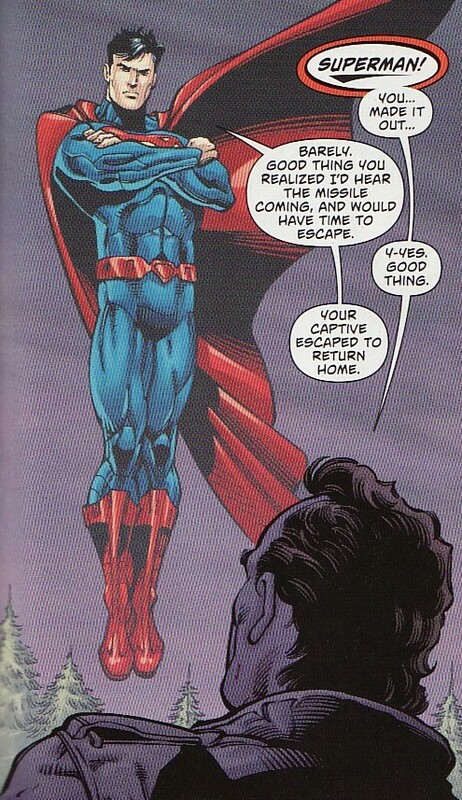 Of course, this was when Superman embraced his humanity and thought of himself as a boy from Kansas. The rest of the issue is a treat as well, especially a Mike Mignola drawn story teaming up Superman and ManBat. As always, I will hope that this new romance is written well and I will give it a shot. But I don't know if it will be my cup of tea. I have been very impressed with the DCNation block over on the Cartoon Network. Young Justice has always been solid and made the '5 years later' jump smoothly. Green Lantern started slowly but rallied at the end, bringing in lots of GL mythology to the show. And the DC shorts have been, for the most part, fantastic. No big surprise, Lauren Faust's Super Best Friend Forever has been one of my favorites. Over on the DC Nation web site, you can now watch a number of the DC Nation shorts, including the first three SBFF episodes as well as all sorts of others; I highly recommend the Catwoman shorts for action and the Animal Man ones for comedy. 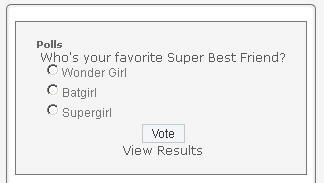 The page is also running a poll (over in the right) asking who is your favorite Super Best Friend. Go vote ... because our girl Kara is running a distant distant third. Regardless of the vote, I love SBFF and keep waiting for the last one to air. And can't believe I see an ad for an animated Supergirl on the top of a web page. These are great times! We are one year into the DCnU reboot and I thought it would be a good time to poll the audience to see what you have thought of the book so far. 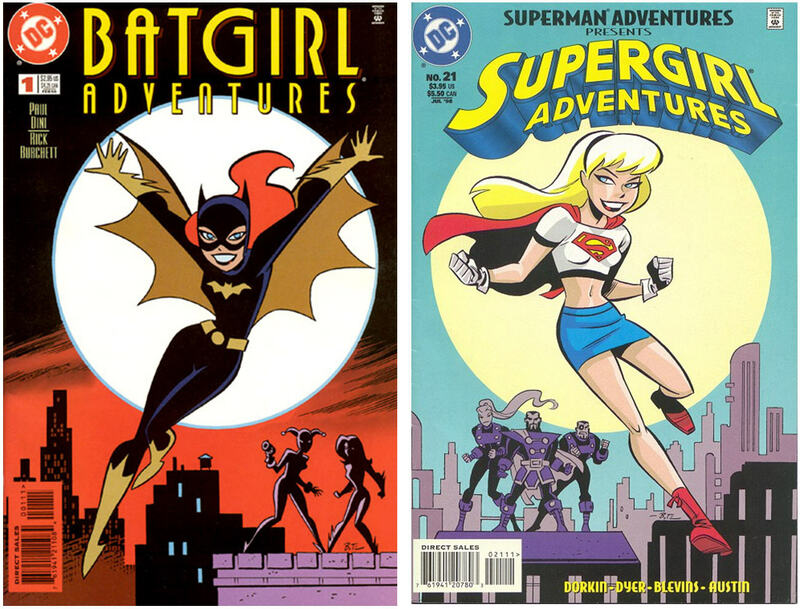 What grade would you give this year's worth of Supergirl stories? Poll to the right. In looking back at the pre-reboot discussion of the character, I was more than a bit worried. It sounded as though the new take was going to be of an isolated, alienated, disaffected, persecuted young woman. I worried that we might be straying closer to the beginning of the 2004 reboot Supergirl rather than the 'hero on a journey' we saw the last 3 years of her own book. As usual, the publicity pieces didn't capture the true feeling of the book. Sure, some of the broad strokes are there but the truth is in the details. I thought I would bring up some of the bigger concepts that have been in the book. The biggest theme for me has been that Kara is basically a stranger in a strange land. 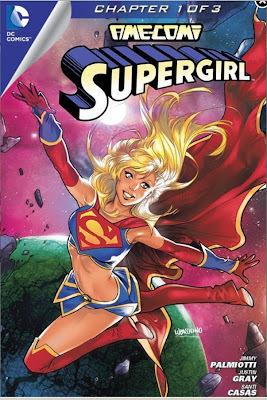 Unlike prior incarnations of Supergirl, where she basically knew she was being rocketed to Earth, this Supergirl awakens to find herself on an alien world. 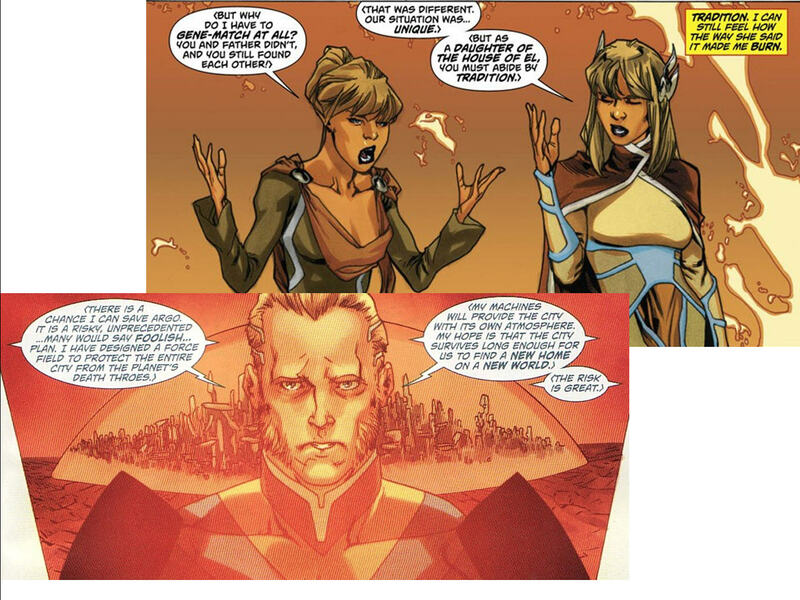 The original Kara knew Argo City was doomed, knew about Superman, knew about Earth. 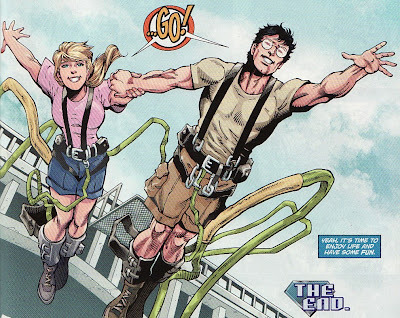 The later Supergirl knew she was being rocketed from a doomed Krypton, following Kal to Earth. This Kara doesn't know how or why she got to Earth. She is lost. In some ways, that makes the main theme of this book one of dealing with grief. And I think that this Kara is working her way through those 5 stages. Even if she says that Earth will never be home in that second panel, she seems to be accepting her new situation more and more. It hasn't been an easy transition with plenty of victories and defeats. 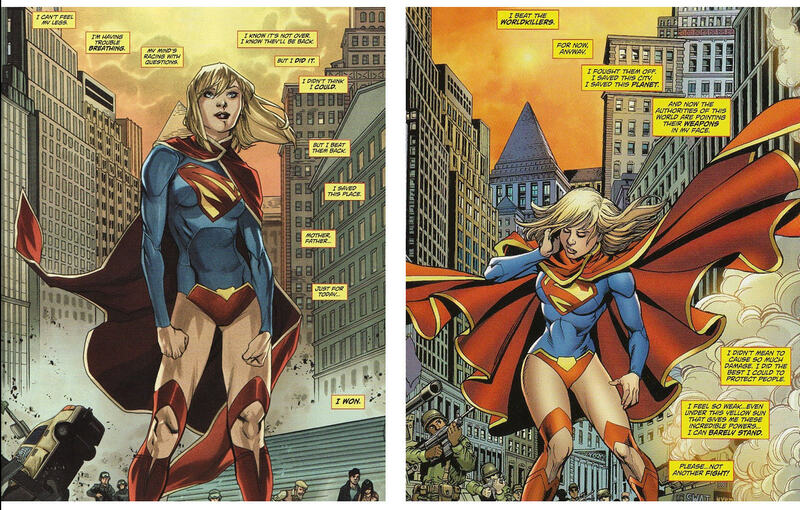 No two panels better illustrate that point better than the last panel of Supergirl #6 (where she is happy to have defeated the World Killers) and the first panel of Supergirl #7 (where she feels she needs to escape the attacking military). If there is one plot point that I would like to see resolved sooner rather than later is this persecution from the military and police. 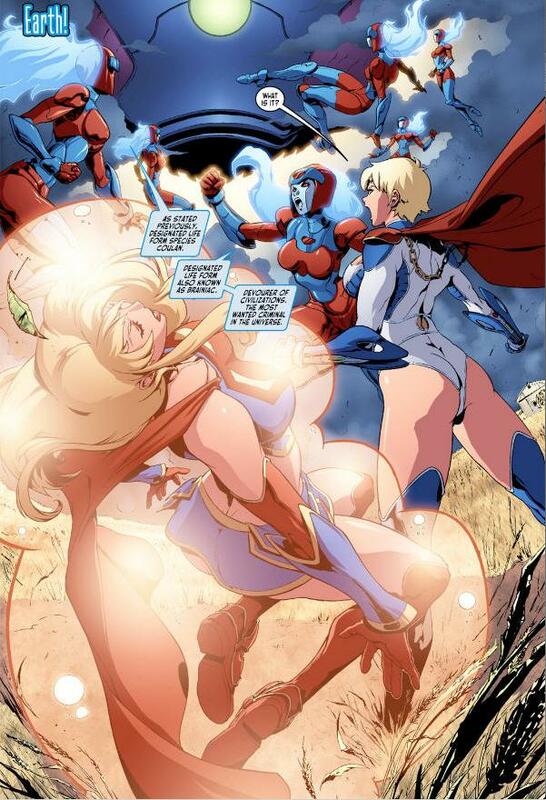 This Supergirl seems to have a good moral compass, wanting to protect the innocent, wanting to help. It is hard to continue to do the right thing when you are vilified for it. At least the public seems to be swayed to recognizing her heroics. The big mystery is still out there of course. Who rocketed her to Earth? And from where ...Argo or Krypton? We have seen glimpses of Kara's life on Krypton, heard from Zor-El and Alura, seen her lessons, and her mother's involvement in her romantic life. We also know that Zor-El is killed. And that Supergirl's pod was in orbit around the sun for at least 5 years. All these things are linked. But clues have been lean. Answers are around the corner but had it been too long without a true 'origin'? During her stay she has actually made a decent number of rogues. The World Killers. Simon Tycho. Black Banshee. 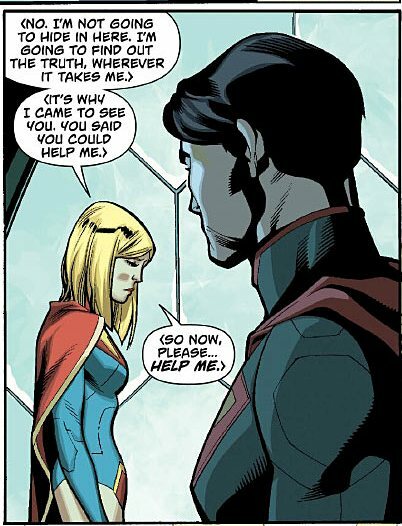 And while I think their last interaction was better than the first one, I still think there should be a better relationship between Supergirl and Superman. The scene in Supergirl #12 was a step in the right direction. Add to that some crazy new powers like super-intuition and a solar flare and we have had a pretty crazy first year of the DCnU Supergirl. Initially the first issues seemed to decompressed. But once the stage was set, I think pacing has been fine. Mike Johnson and Michael Green seem to have a grasp of just who Supergirl should be. And Mahmud Asrar's art has been breath-taking. So please vote. And comments are always welcome! I'll tell you my grade when I review the poll results next week! 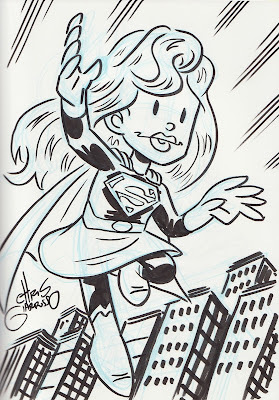 One of my goals whenever I head to a comic book convention is to come home with goodies for the supergirls at home. And luckily at ComiCONN, I came across a dealer that had a pretty big chunk of some recent Johnny DC books (and by recent I mean the past 15 yrs or so). While these books usually are in rough condition in the 50cent box, this dealer had them bagged and boarded. 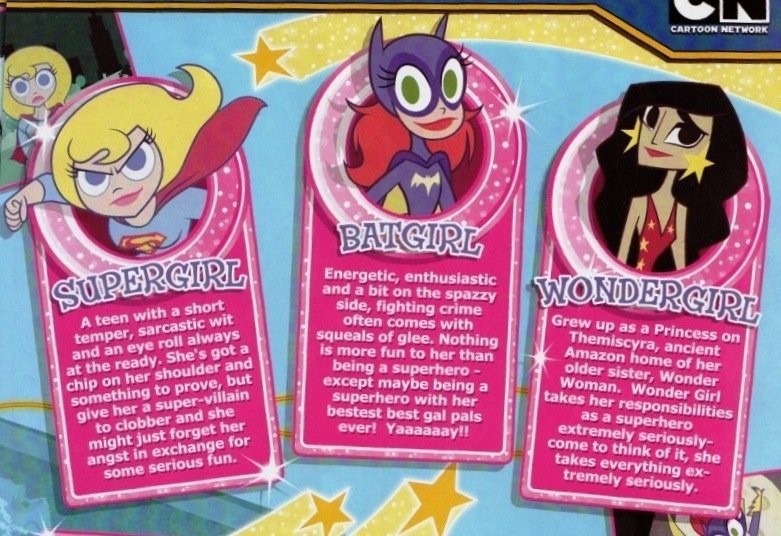 In some ways it was good since I could easily thumb and find as many DC books that would interest the girls. In other ways it was bad because the dealer called them 'rare' kids' books and was charging $2 a pop. Still, it is my prerogative to spoil my kids with comics, so they got a nice set of Batgirl related Batman books as well as a bunch of Adventures in the DC Universe. 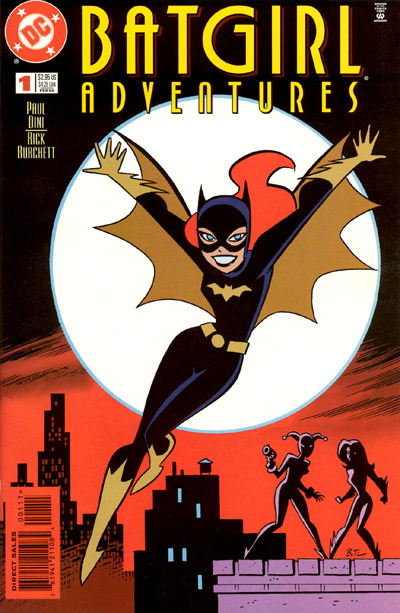 One of the issues that struck me as a find was this Batgirl Adventures one-shot by Paul Dini and Rick Burchett with this great Bruce Timm cover (more on that later). Anyways, in the issue, Batgirl has to help Harley Quinn rescue Poison Ivy who has been kidnapped. So why talk about it here? 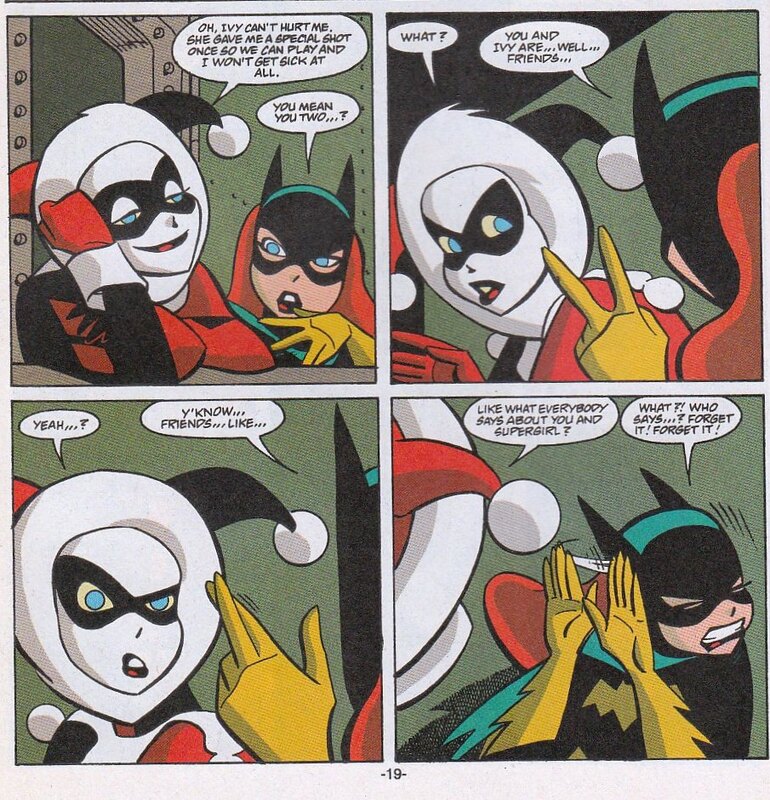 Well this interaction between Harley and Batgirl is too fantastic and therefore must be shared, playing off the mostly assumed romantic relationship between Harley and Ivy. Harley moons over Ivy a bit, saying that Ivy gave her a shot so she can't be poisoned whenever they 'play'. Batgirl sort of pushes Harley a bit about their relationship implying they may be more than friends. I thought Babs response was funny. I guess she hadn't heard those rumors before. The rest of the issue is just as fun. Back to that Bruce Timm cover. The composition of the cover was used by Timm later that year when Superman Adventures #21 became Supergirl Adventures for an issue. It is a perfect complement to the Batgirl cover, showing the similarities of the heroes but highlighting the different approaches. So sun instead of moon, futuristic cityscape as opposed to more classic buildings. I love that both heroes are smiling brightly, happy to be adventuring. Look at them side-by-side. 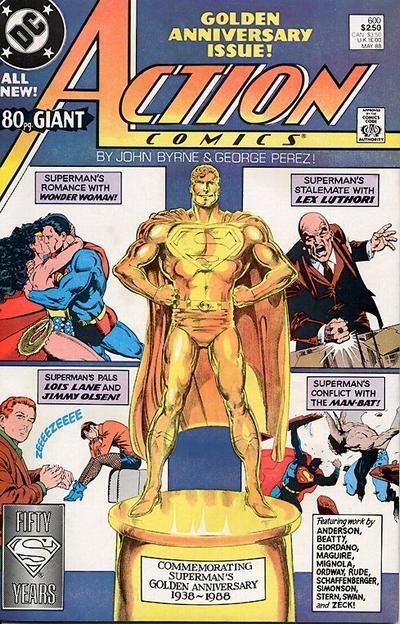 You would think that DC would have made mini-statues or bookends or something collectible of these. 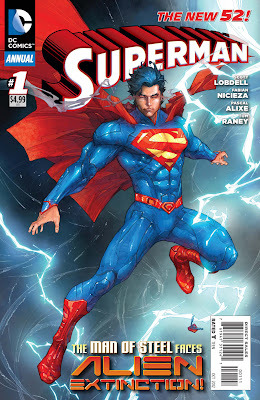 Superman #12 came out this week, the last issue of the Dan Jurgens 'era'. This book seems to be struggling to find its way, getting it's third creative team in a year despite this being a major reboot. Add to that the Rob Liefeld twitter-storm from 2 days ago saying he is leaving DC because the editors were micromanaging his title. I don't read any of Liefeld's book ... but this complaint about creators being stifled has permeated the DCnU and it is disheartening as a fan. We heard George Perez say the same thing about his treatment here. So I entered this issue with a bit of apathy, a bit of ennui, and a bit of despondency because it seemed like DC just doesn't know what to do with Superman. 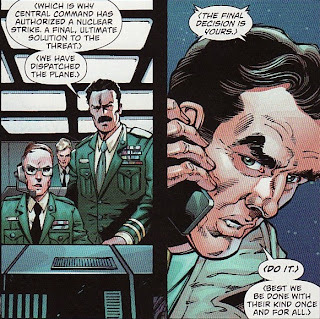 As for Jurgens, I think he must have known that his time was short and wrote a relatively forgettable story which echoed his Helspont arc from just a few months ago. Here, an alien is played up as a foil to Superman, a vision of what he could have been, or ... more chilling ... what he might become here in the DCnU. I think Jurgens has a great grasp of what Superman is and so in many ways I am sort of sad to see him go. One of the slight missteps I have felt about this last arc has been Jurgens' portrayal of Lucy Lane. She initially is portrayed as a sort of flirty thrill seeker that has men swooning at her feet. She has little patience with people and it is hinted at by Lois that she can carry a grudge. And yet, Lucy continues to pursue Clark and give him chance after chance. I don't quite know how to reconcile this patience with Clark with the implied quick axe for others. Maybe Clark is considered that much of a catch? That mysterious? Of course, Clark has been beaten to a pulp by the alien the Russians plucked from another dimension. Trussed up as Superman he is forced to watch the alien opening up a portal back to home ... maybe to let in an invasion force? As for the Russians, they decide to literally go for the nuclear option, firing a nuclear missile at the power plant where Superman and the alien are, hoping to rid the Earth of both. Seems like a rather quick decision to nuke your own country. Now despite having been pounded by the alien last issue to the point that the 'indestructible suit' is tattered and back to basic white, Superman handles him pretty easily here. Using a 'stick and move' fighting style, he batters the alien. Seemed a bit off. At least the two can talk. The alien says he didn't come to Earth but instead was basically kidnapped. He is opening the portal to return to his world, despite Superman's protests that he stay to answer for the crime of obliterating all human life in a Russian town. 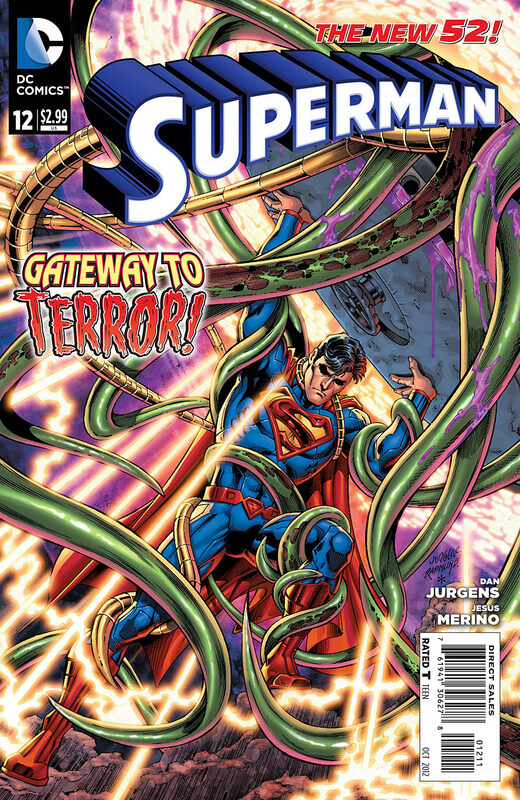 Again, like with Helspont, Jurgens uses the alien as a mouthpiece for what Superman could have become under different circumstances. Here it asks why would any alien stay on a world not their own. It's a question some people ask of Superman ... why would he stay amongst us. Moreover, the alien says that the Russians wanted to make him into a weapon and so he became one. I do wonder if this might be some slight by Jurgens on the direction of Superman in the DCnU. This is an alien, foreign to Earth, with great power. Why would he do good when he can act as the aggressor? Is Jurgens wondering if the current powers that be are turning Superman into a weapon, a gritty hero, and not the heroic inspiration he has been for decades? Or is he merely showing that Superman could have felt like this alien, become a force of destruction, but instead rose above it all. Unbelievably, the Russian missile actually does strike the power plant but not before Superman has fled and the alien has escaped to his dimension. So lots of destruction for naught. 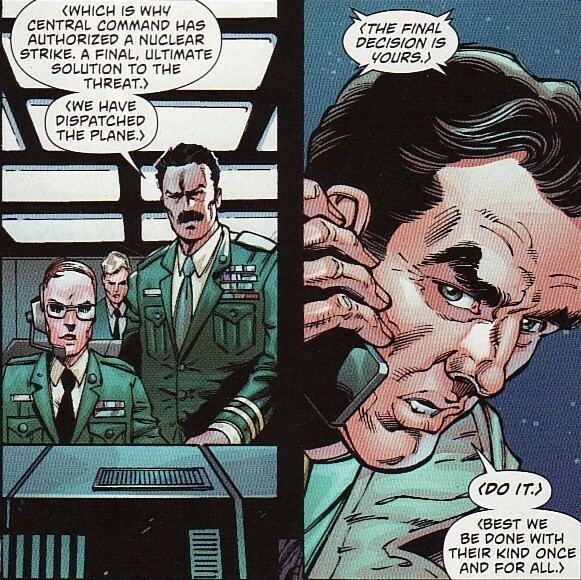 I do like that Superman called the Russian agent on this tactic, wondering why he wasn't warned about the incoming nuclear device. 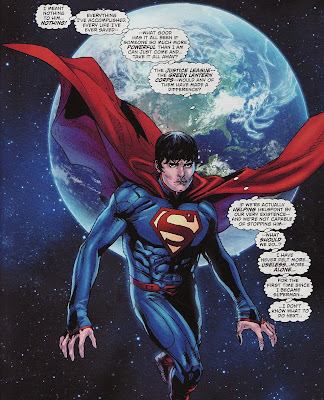 The strength of Jurgens run has been to hammer home that point that Superman doesn't want to rule, he doesn't want to destroy, he doesn't want to be considered superior. He wants to help. "They" should know he is here to help ... "everyone". In my heart, I think Jurgens is again saying that to the powers that be. That everyone knows what Superman is about ... so write those stories. I don't want Lobo or Wolverine or Batman in a Superman suit. They aren't Superman. I would love to ask Jurgens if this was his intent here. And then, as if giving Clark a little going away present, Jurgens let's him have fun. He loves being on Earth. He should cut loose. He picks up Lucy for a date of bungee jumping. He's smiling. Again, it seems bittersweet. Because I think Jurgens gets Superman. He certainly had him say all the right things on these 6 issues. But now he is gone and I have to wonder just what Scott Lobdell is going to bring to the table. All that said, despite the nice moments, this is a pretty nondescript issue most likely constrained by the impending change in creative leadership. How can DC not know how to handle Superman?? I am definitely a 'floppy' kind of a comic collector, having yet to purchase a digital comic. 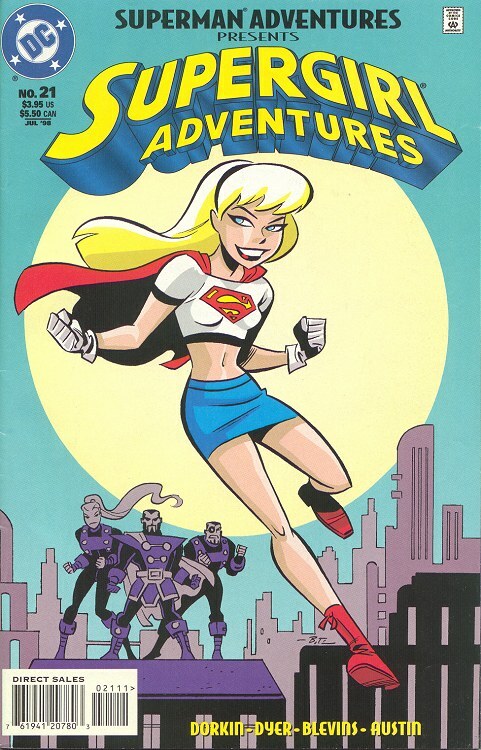 And while I have avoided the Ame-Comi Supergirl collectibles, I was intrigued to hear that DC was going to do an Ame Comi digital comic and wondered if I should check it out. Having Amanda Conner do the opening book, with the Ame Comi Wonder Woman made it even more interesting. So I was pretty happy to see that DC will be releasing the chapters eventually in print form. The Ame Comi books are being written by Jimmy Palmiotti and Justin Gray. The art on the Supergirl issues is done by Santi Casas. 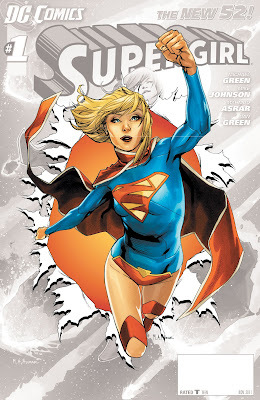 I would love to hear from people who have read the Supergirl issue or any of the prior chapters what they have thought. It is hard to move away from the cheesecake art that seems to be the foundation this book is built on. Even in this one page I found on the net, it seems all so embarrassingly titillating. Does the story transcend the images? Is it a fun book? Is it worth getting when it is finally released on paper?